While the eurozone grapples with what to do with Greece, an absurd side show has gripped the German public for the best part of a week - did Yanis Varoufakis, the man in charge of Greece's finances, make a rude gesture to Germany in a past video. The drama began last Sunday (15 March) when Varoufakis appeared - via video link - in a popular talkshow along with a columnist for Bild newspapers (a tabloid known for its screeching headlines about Greeks), a right-wing politician and a journalist. 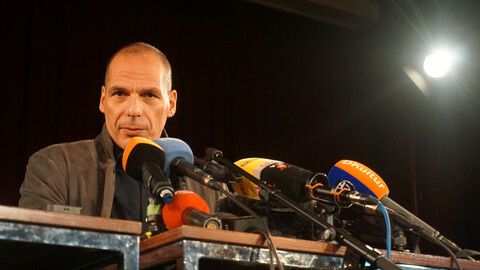 The debate was hum-drumming along - stilted by the simultaneous interpretation of Varoufakis' English - when the presenters screened a video clip of Varoufakis giving a talk in Zagreb in 2013. In the clip Varoufakis says Greece should default on its loans: "Stick the finger to Germany and say . . . you have to solve the problem by yourself”. At the same time he is shown sticking up the middle finger of his left hand. 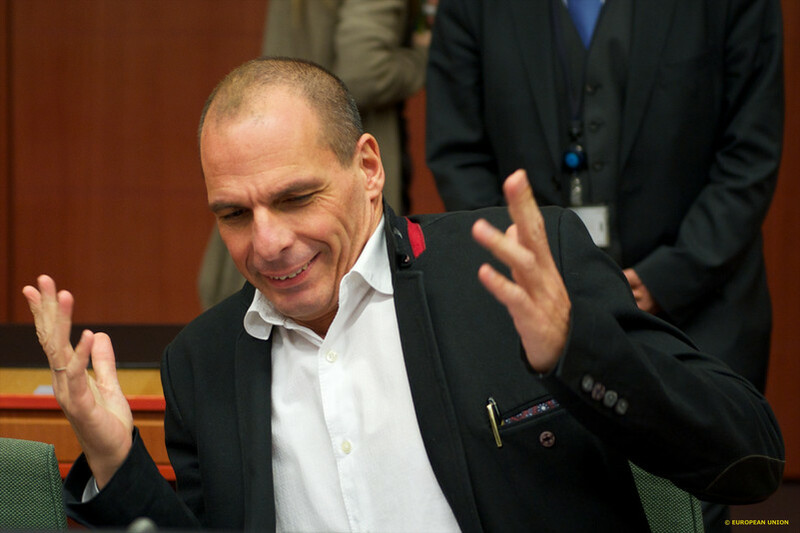 Varoufakis immediately denied making the gesture - known in German as giving the 'stinkefinger' - and said the video had been doctored. The German media was beside itself with this sudden topic du jour. Anything that anyone said - sensible or otherwise - about the Greece, the eurozone, German taxpayers' money in the chatshow - was obliterated by the need to get to the bottom of the Stinkefinger debate. The Bild newspaper ran an article with part of the text highlighted in the shape of an offending digit. People rushed to look at the video, and, by and large, reached the conclusion that the footage was real. Varoufakis added to the confusion by posting an extended version of the video on his twitter feed Monday saying "And here is the 'undoctored' by the unscrupulous media's video". But in that video, there he was making the gesture. Everybody was nonplussed. Were there several meanings of 'doctored'? By Wednesday things might have started to run out of steam as people started to wonder whether this really was key to the eurozone crisis and relations between Greek and Germans. 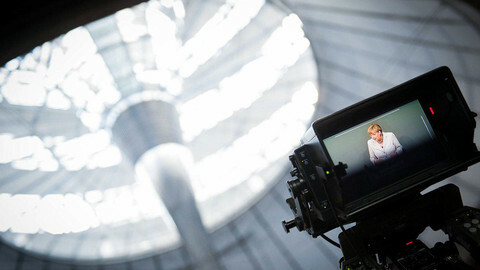 But that evening, Neo Magazin Royale, a satirical programme, claimed that it had doctored the video used during the chatshow. "Sorry Mr Varoufakis, we won't do it again," said Jan Boehmermann, a satirist. This prompted Varoufakis, again on twitter, to ask the chatshow's host Guenter Jauch to apologise "for having used a doctored video to silence a conciliatory Greek voice". Media ran the video-actually-doctored-after-all story and soul-searched a little about falling for the first video. Only it turned out that Boehmermann was indulging in some drawn out satire. The video that Neo Magazin Royale posted 'without' the finger was actually the 'doctored' one. Twitter went into a confused tailspin. The hashtag #Varoufake and #varoufakefake was everywhere. As was the Denglisch word 'gefaked'. In his own video Boehmermann spoke of Germany "devastating Europe two times within a century but going nuts when somebody is giving us the finger". 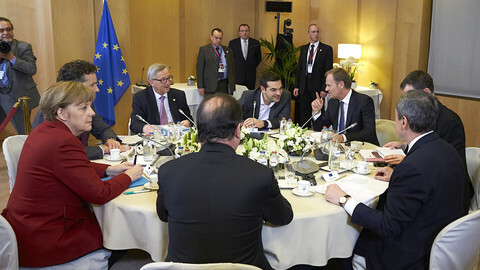 He appeared to be skewering several things at once faux outrage, attitudes to Greece, Germany's attitude about itself. The debate has well and truly disappeared down a rabbit hole. In a late night meeting in the margins of the EU summit, Merkel and Hollande told Tsipras to "quickly" fall in line with reform commitments. After several weeks of increasing tension between Germany and Greece, the two countries’ leaders are meeting in Berlin on Monday.